The weathermen said yesterday that we might get a "dusting" of snow last night. So imagine our surprise when we woke up to 3-4 inches (and it's still snowing)! Our church got cancelled so we settled in for an unexpected snow day. Scott panicked that we might starve (because I had planned to go to the store today and our pantry was close to bare. )(and we were out of diet coke which is pretty much a national emergency) so he went to the store this morning and we should be set if we are here for another 3 weeks. ha! We bundled Harper up this afternoon and took her out for a few minutes in the snow. I really didn't let her get in it because I didn't want a wet baby or a sick baby but I held it and let her look at it and she said "OH!". ha! I think she thought it was like cold sand. I can't wait for when she is older and we can sled and build snow men and she can stay home from school and we'll make cookies together. But today we just had fun looking at it and maybe throwing a few snowballs at daddy! I am not a fan of winter but I sure love snow (as long as I don't have to drive in it!) This is the first year that snow doesn't cause me to have a stomach ache because I'm so nervous about driving to work in it. ha! Somebody else in our house LOVES the snow. Can you find him in this picture? It's like a game of "where's waldo"! ha! I would say this is Harper's first snow but her first REAL snow was when she was two weeks old and still in the NICU in Tulsa. I'll never ever forget as long as I live me, Scott and my mom sliding through the hospital parking lot and down the road to the Ronald McDonald House or sitting in the hospital cafeteria looking at the snow and how we had a few quiet days with no visitors and our poor nurses were stressed about getting home. Or my poor dad at home with no electricity and trees down all over his property because of the terrible ice storm that hit their town. That snow storm will stay with me forever. I had several blog friends suggest this so I thought it would be fun! I brought in some CLEAN snow and put it on her high chair and let her play with it for a few minutes! Harper looks so cute all bundled up & that pic of Dawson is hilarious!! I love the picture of you throwing the snowball! It's great! Living in Wisconsin, I am so used to snow. However, since having my daughter last February, I notice that I am so much more cautious than I used to be. I drive like an old lady somedays! Glad you all got to enjoy a day at home together. Enjoy the snow! I feel the same way about snow!! I am lucky to live in Texas!! Although I'm not sure how I will survive in New York when we move there later this year!! YIKES!! Wish we had some snow here in KY! The weatherman says we might get some the middle of the week! Great pics! Better to have the snow now than on the 16th!! I love all those snow pics!! I know you are as happy as I am to see snow since we missed the Christmas snow! I think yall got more than we did in Fay. Matt and I played in it at 2 am! It was so beautiful coming down last night!! Hope you have a great snow day!! Love the snow pictures! Looks like SO much fun! It is supposed to snow here in Houston, Texas Thursday morning. I am crossing my fingers! I love that close up pic of the two of you! You look so pretty and happy! I remember reading you blog and you Dad's blog about the snow and ice storms -- hard to believe that was almost a year ago! I love snow because I love to ski - but I have to travel to see it! WOW!!! We need some of that snow!!!! Looks like ya'll had lots of fun!!! Kelly I am relatively new to your blog. But I just have to say how much I admire you, You are a ray of sunshine to this sometimes pessimistic Grandma. Blessings to you and your sweet Harper and your husband. Just an FYI that you m already know, but maybe not, you cannot get sick from being wet or cold. You actually need to have a virus to get sick. So going out without a hat and getting sick from that is an old wives' tale. Just something you may want to know for those days that you want to have a little fun outside!!! So cute!! Unexpected snow days are the BEST! I hope I get one before too long. Love seeing my Harper out in the snow. I know that Dawson loves it. He had plenty of experience with it here last year. Aww, I'm no fan of the cold weather either, but I wish we had snow here in Louisiana, maybe next week ~ it's supposed to get really cold! Harper looks so cute! Those are some of the best pictures you've had on your blog! Can you believe the winter we are having already? Cute pictures! I think I have that coat too! Wal-Mart?? Driving in ice/snow completely stresses me out. Thats why I glad I work in Education, most of the time if it is icy I don't have to go! Woo hoo!! Love that picture of you throwing the snow ball. So fun! Oh please send some down to South Arkansas! We would love to see some. My 2 kids have only ever gotten to play in the snow once in their lives and Will was only 8 months, so it doesn't really count for him, ha! Glad you all had fun. Snow is, I believe, our consolation prize for putting up with the freezing temps, ice and grey skies of winter! :) I live in northern-Ohio, so we get a fair amount of all of the above, but the snow is definitely more exciting now that I have kiddos that love to go out and play in it!!! Harper is so cute in the snow and throwing snowballs at Daddy? The best! :) Stay warm and enjoy all the cuddles that the cold weather brings. I'm so jeaslous that you got to take Harper out in the snow. We will probably never get that much snow in Mississippi in Bailey's lifetime, haha! And if we do, we sure won't have that many coats and hats and gloves. She looks so cute. I know that was so much fun! So glad Scott made it to the store and you guys got to take Harper out to experience the joy of snow! It looks like a lot of fun!! We haven't bundled up our little one for a trip outside in our snow. She's just 7 months and I know she definitely wouldn't understand! Looks like you had a fun time for the time you did get to spend outdoors--especially Dawson!! Oh please send it to Alabama!!! My kids are 10 and 7 and have never seen a "real" snow! In 10 years we've never had more than 1/2 an inch! And it was gone by 10AM!!! We have to travel to play in the snow! My kids would be in Heaven if we had snow AT OUR HOUSE!! You and your snow baby look so cute in the snow....BUT...DAWSON looks ADORABLE!!! That picture of him just makes me smiiiiiile, bless his heart! Awww..what a fun memory! And I agree - snow is fun, as long as you don't have to drive in it! I love snow days too but it would take a lot more than 3-4 inches to make it a snow day up North! Now being without Diet Coke would be an emergency!! These pictures are some of my very favorite you have every posted - SO SWEET!! I am jealous of the snow, too. My kids and husband are up in Harrison with lots of snow, but I'm stuck in Little Rock on bed rest and we were supposed to get some flurries - nothing so far. I haven't seen our lawn since before Christmas. It's so cold now, though, that it's not pretty, fluffy snow. I can't believe your church got cancelled for 3-4 inches! CRAZY!! Looks like you were having fun in the snow. Your pictures are beautiful! It snowed a little here, but nothing like what you got. ah kelly im so glad harper got to experience snow and get out in it. You two just looked adorable out there! I can not get over how everytime I see a picture of harper she is geting prettier and prettier. She is just adorable. I once lived in the South and love how a little snow shuts everything down and you get to have snow days! The best part of your snowfall is you get to enjoy it, play in it and then it melts. I'm jealous. Not so lucky on the frozen snowy prairie. Enjoy your snow! We must be neighbors! LOL..The weather man said a "dusting" for us and we got 3 inches of snow again! Looks like you had a great time! SUPER jealous that y'all got snow, I wish Memphis would get that storm y'all got :) Happy New Year and Harper is adorable in her snow outfit! We've taken B out but I won't let him touch it either! All of our neighbors have their kids out playing - I can't wait for that day!!! It snowed ONCE at my house when I was 7 years old, and I thought the excitement would kill me. We NEVER get snow in Southeast Georgia!! Great pictures. You could scoop up a bowl of snow and set it and Harper on a towel in the kitchen (or in the bathtub). I use to do this for my kids when they were little. South Central Missouri got snow and it's still snowing...we are loving it! Wish they would cancel work tomorrow! :) Enjoy your time home! I don't like to drive in it or even get out in it at all if I don't have to. But it is beautiful to look at. I do have fond memories of making snowmen with my girls when they were little though. Before too long you will be doing that with Harper. Loved the pictures. You are so cute! What sweet pictures! I have enjoyed visiting your blog this year. I am a native Memphian displaced to the midwest! Has taken most of my 7 years here to get used to the snow we get here! Glad to see AR won the Liberty Bowl. Happy New Year to you and your family, and may you be blessed in the new year. BEAUTIFUL pictures! It looks like a Gap commercial! I don't think ANY of us who lived through last year's ice storm will forget it! I love the expressions on Harper's face. looks like a great time! we have tons of snow in KC too! your dog looks hilarious! mine wants nothing to do with it! haha poor baby! Those are great pictures, Kelly! adorable pics!! so jealous. my boys keep asking when is it going to snow down here. they don't understand that louisiana just doesn't get snow! you look great! love your hair and harper is as adorable as ever! enjoy. Love the look on Harper's face when she's looking at the snow! She's not sure what to think about it :) I love a snow day! Oh how fun! It took us 15 minutes to get our daughter in her snow gear and she acted like we were dipping her in acid she fought us so much, but the moment we got outside she was in heaven! I know that I am looking forward to snow days and making cookies with her too! Love the pictures. Harper looks so cute in her snow gear! I LOVE snow too---but here in Iowa, we got about 24 inches last week---talk about A LOT of snow!!!!! Cute pictures! Y'all got way more snow than we did! The roads here were clear when we went to church around 10! I'm glad y'all were able to make some fun memories with Harper today! fun pictures!! I put Lucas in a snowsuit for his first time in the snow about a month ago and he HATED it. I think I made a mistake by putting him in it, it was probably too cold on his bum or something!? But he sure looked adorable! So much fun. You two look great. Dawson is too cute in the snow! Cute pictures! I would be a fan of snow if we only received 3-4 inches. :) We got 20+ on Christmas Eve/Christmas Day ... which makes me not enjoy it. Love the snow pics. All my previous dogs have loved the snow, especially chasing snow balls. But the dog I have now (prissy standard poodle) doesn't want to get her feet wet. Glad Dawson is having fun. Next year Harper will be playing with him. We may get a dusting Thurs. night. Everything will grind to a halt here if one flake falls. No one in Ga. knows how to handle snow. Those are great pictures of the 2 of you! So fun! Send some to NC please! You could make some snow ice cream! Being a from Arkansas and now living in Michigan, my kids LOVE it! Mix all ingredients except the snow. Mix well. Then add clean, fresh snow till absorbed. Looks like you guys had fun. Love Harper with the snow. I'm not as excited about snow as you, but somebody has to be. Ha, glad it's you. I'll take a warm beach any day. She is so cute What a great idea to bring snow in and let her play with it! Stay warm and cozy !! how cute are you, kelly?!? love the pics!!! Kelly, your hair looks awesome today. what cool pictures! What camera and lens are you guys using? I would love for you to make a post about what camera/lens you use and any photo tips you have! I love it! When my son looked out the window at his first snow (he was just over 2 years old), he said "Where the dirt go, Mommy?"...hehe!! Harper was adorable all bundled up! Enjoy the snow days at home! So fun! I hope we get a snow day soon in B'ham, maybe Thursday the weather people say, we'll see! 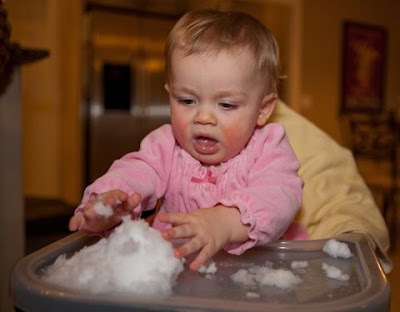 And thanks for the idea of putting the snow on the highchair tray-we might do that too if we have any snow. Great way to stay in and not get sick!! Happy early b'day to sweet Harper! I don't know if I've ever left a comment or not before because I know so many but I thoroughly love reading your blog. Anyway, I'm one of those people that want to know where you got your jacket, lol! I normally don't ever have to ask where you got something because enough people have already asked and you've already posted it by the time I read it but I do love your jacket and was hoping maybe it was a new purchase I could still find. If you get a chance to let me know please do! Take care and keep blogging!! Being out of diet Coke is an emergency here too!! But I have to know how often you color your roots! Or is your stylist just that great? Based off pictures you have posted before your hair is naturally dark, right? And the pic of you and Harper shows your roots! Amazing! I swear as the day after getting my roots down I already need a touchup! Great pictures!! The snow is beautiful...wish we would have gotten a little more than our "dusting" in Central AR! 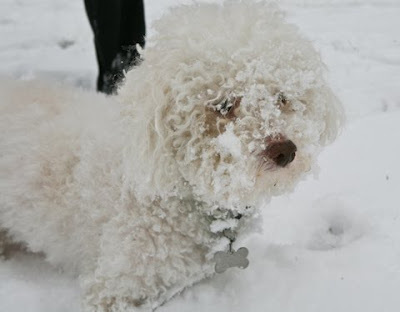 My 2 yr old son was looking at the post with me and when he saw Dawson he said "thats snow doggie"
Too cute! Looks like you guys had fun! I have to giggle that your church was cancelled! We have had snow on the ground since Christmas day and it looks to hang around for awhile with our low temps all week (about -8 this morning). I'm sure the folks up in MN and SD laugh at us when we have everything cancelled for a 10-12" of snow! Your pics are AWESOME and I love the "snow on the tray" idea! See ya soon sweet friend! Precious pictures! I love it! Still cannot believe our girls will be 1 in less than 2 weeks. Crazy how fast this year went by - I love to see Harper doing so much of what Evie is doing. I will try the snow idea with the highchair if it ever snows here in TN. My word verification is hogrand! Love it! well, I want to know where ya got your pants! I love the flare on them? Are they ski pants or fleece pants? How fun! I sure hope we get some snow soon! Your snow pictures are beautiful! And I love the 'snow on the high chair' idea...that is genius! I am just dying for some snow around my neck of the woods! I would love to send my kiddos out to play for hours and then welcome them back in with mugs of hot cocoa... but alas, I have rain. Not snow. Most precious pictures ever! Glad yall had a wonderful snow day~! 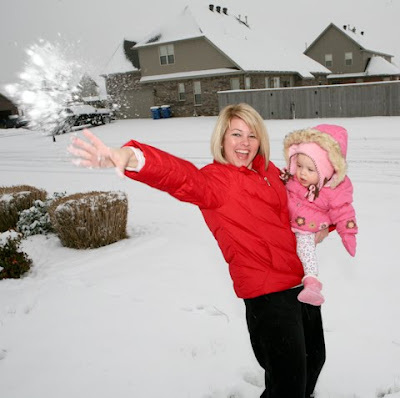 I love the pic of you throwing snow with the babes! So cute! Snow Cream, Kelly! Snow Ice Cream!! Ever had any? My dad was from Ohio and it is common up north. Gather clean snow and mix vanilla, sweetened condensed milk and evaporated milk-if needed. Yummy, is not the word. Actually, you could mix about anything with it like you make normal ice cream. No need to run through the ice cream freezer, though. If you've never tried it, you should! Those are the most precious snow pictures ever. You will treasure them someday!!! it looks like you and H had so much fun! Soo cute! I'm in LR and it has snowed a tiny bit with some sleet but not near that much. I wish we would get some though so I can take my 2 year old out in it! She would love it! I was going to ask about your camera and lenses and I saw someone else did too. I am with her, that would be an awesome post! I just got a new Rebel so I am all into that right now. Your pics today were great! Glad to hear you say that she'll stay home from school and not go to school at home! What beautiful photos! And that idea with the high chair is genius! These snow pix are awesome! What a great idea to put some on her highchair! She is so precious and I hope y'all have a wonderful day! Great pics. I'm totally jealous of all that beautiful snow...out here in AZ. Please stop by my blog for today's first ever (RED) MEATLESS MONDAY'S LINKY PARTY!! I bet it was fun to watch Harper's reaction to the snow! My London (15 mo) loved it for about 2 min before decided "no thanks!!". haha! And my poor dog HATES snow. She's a little 5lb puppy though. Looks like y'all had a really great weekend! I love the pictures of the 2 of you together! Definately something to frame! That is so much fun! Oh, and I got the same coat for Christmas - Red for Georgia Bulldogs... though I know who your red team is! Harper is turning one soon - are you ready? My son turns one three days after Harper. I am SO not ready! I got the bright green one and wish I gotten one in every color too! Harper's face in that last picture is too funny! It looks like she's not quite sure about that snow! And I love the snow puppy! It looks like he was trying to root for truffles or something! LOL! I bought that same coat from Walmart last year (but in black). it is the warmest coat I have ever had! I vowed to buy another one this year, but they were shimmery and were $15 dollars so I didn't! I'm new to your blog and love it!!!! I didn't know where to ask this but didn't know of another way to contact you but I was trying to find a recipe that you posted some time ago. It is for banana pudding cheesecake. Thanks so much! We just had snow like that too on our vacation to Montana! Now we're back in 73 degrees (phoenix) and I am SOOO homesick for the snowfall and snuggling in. I'll live vicariously through you, I suppose! Love your pictures, Harper is beautiful. You are a blessed momma and I love to read your blog-it encourages me with my four small children and it's refreshing to read the hope that Jesus offers all of us. Happy 2010!! Oh I have another suggestion, in case no one has mentioned it - I made a snowball from each of my kids' first snows and stuck them in the freezer. We still have them - one of them is four years old. I got the idea from a friend, who has a 13 year old son, and they still have a snowball from his first snow in their freezer. looks like fun. although in wisconsin it never seems quite as fun! lol. First...love the snow pics! I'm so with you on being mad about that $10 coat! Kicking myself too! LOL! Sad we didn't get more snow down here in the valley (live in Alma) but glad you enjoyed yours! We are in NY so used to snow. I had to laugh that Church was cancelled. We got 21 inches a couple of weeks ago and my daughter still had school HA! My school (different district) did close though. When they were too young to play in the snow, I would bring in clean snow for them to feel and touch for a while too!! Harper is so cute!!! Your camera takes such great pics! What kind do you have? What great memories! Haper has to be the cutest little girl ever! I/we have snow envy! I know... I will post it to my blog. Let me know when you see it. I think it's kind of cute that things were closed down for three-four inches of snow. I am in MN....you can only imagine what it takes to close things down. What a cute snow idea. Next time we get snow..which should be soon...I am going to do that! I'm with you on the cold weather. I must prefer warmer days. It is indeed though. What a good idea to bring the snow in! I never would have thought about that - well, except to make pollution ice cream. :) I'm surprised I'm alive after eating that so many times as a young person. ha! Oh, and I love your coat! $10? Wow! My daughter bought me a coat at Kohl's for Christmas that I love! I never would have spent the $50 on myself, but I was happy to accept the most lovely gift. Enjoy the snow!!! Cute pics! Aww, I love her face as she's trying to figure out why that white sand is soo cold and on her high chair...too cute! These pics are awesome! Poor Cilla may not see snow until she is 10! Of course, we go to Little Rock for Christmas and in snows in Texas and not in Little Rock! I am jealous...I miss all the snow (and I miss NWA)! Precious! Oh, how this makes me want to have snow in Texas, but there's just SO much. Beautiful pictures Kelly!!! We have been snowed in all week too here in Cleveland with at least 8-10 inches of snow. You would have loved it!!! Have a great week.